Last week I was thinking a lot about how far I've come with my diet and training over the past couple years. I went from eating a lot of processed foods, soy and dairy products, candy, heavy on the booze and barely stepping foot into the gym to cutting out ALL processed foods, soy, dairy and candy, going very lite on the booze (about once a week) and hitting the gym hard with weight training and a little cardio 5 to 6 days a week. I thought it would be fun to put up a side by side comparison shot of unhealthy Amber (May 2009) and super healthy Amber (August 2011). For all the girls out there who are afraid to lift weights because they are scared to look "manly" and will "bulk up", the proof is in the protein shake, YOU WILL NOT! 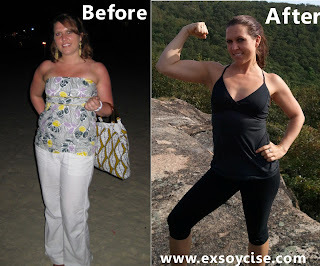 The only thing that will happen is you will become leaner, stronger and have the body you always dreamed about. A clean diet consisting of lean meats, complex carbs, veggies and good fats along with weight training and cardio will beat an unhealthy lifestyle every time! I will never regret the day I was introduced to weight lifting and I will never look back!